Worms can infect your cat in many ways, and once done can cause diarrhoea, fatigue, reduced fur condition, increased appetite and spontanious weight loss; which can become dangerous. There is however a good chance that a cat will not show any signs of being infected, but should you discoveror suspect that yours has been infected, addressing the issue should be done as soon as possible. 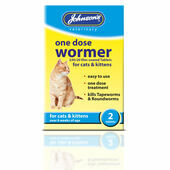 Our worm treatments are capable of getting rid of the worms and their eggs, restoring your cat to good health. If the worms persist then a vet should be consulted.